Spring is coming and snowmen are melting! 1. Gather your materials. You will need white cardboard, a black marker, two small branch pieces, two black buttons, white felt, a Styrofoam ball, scissors, orange foam, fabric, white glue (or hot glue), and cotton balls. 2. With scissors, cut an irregular shape out of the white cardboard to represent melting snow. 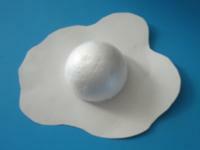 Cut the Styrofoam ball in two and glue one half in the centre of the cardboard shape. 3. 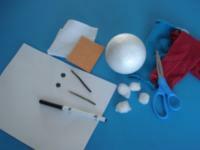 Wrap a few cotton balls with white felt to create a medium-sized snowball. Glue this snowball on top of the Styrofoam ball. Glue a cotton ball next to the snowman to represent the head which has fallen off the snowman. Using the black marker, draw tiny dots on the cotton ball to represent the snowman's mouth. Cut a carrot shape out of the orange foam and glue it next to the snowman. 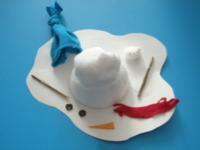 Cut a scarf and hat shape out of the fabric and arrange them around the snowman. 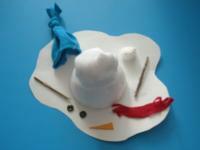 Complete your melting snowman scene with the tiny branches (snowman's arms).